South Georgia Equipment offers Produce Handling Equipment and Supplies to the Fruit and Vegetable Industry. Our family-owned-and-operated business, located in the heart of "Sweet Vidalia Onion" country, has been established since 1999. Our primary focus is to improve quality while reducing labor cost for our customers. 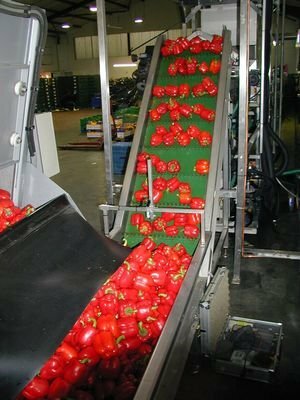 After traveling throughout the world doing extensive research, South Georgia Equipment has formulated a team of leading manufacturers of the produce equipment industry. Why did we choose these manufacturers? Not just because of their reputation throughout the industry but for the personal involvement in their company. We needed manufacturers who were willing to listen to our customers and offer solutions based on their individual expertise. With over 35 years of combined experience, South Georgia Equipment offers solutions to existing problems and set the pace for future growth. Flott offers afforadable washing and peeling technoloy for 'start-up' to large procesors. Flott washers and peelers are suitable for onion, garlic, potato, carrot and other types of root crop vegetables from semi-automatic to complete automatic systems. Dust and Onion Husk Extraction Systems. SGE identified the many problems that dust and onion skin or husk created in the potato and onion packing sheds and now offer a custom designed extraction solution. With SGE�s extraction solution we offer customers a cleaner facility, reduction in downtime, labor savings all while promoting a safer work environment. KW Automation offers a range of graders, Inline Weight Graders, Electronic Weight Graders and Circular Weight Graders which have the flexiblity to handle most delicate fruit types, ie. tomato, mango, apricot, rockmelon, canteloupe, plum, stonefruit, apple, citrus, avocado, potato, button squash, and variuous other fruit and vegetables. KW Automation graders are designed to operate either separtely or as part of the fully integrated KW line. KW Automation offer graders with collecting hoppers, collecting stations, shallow bins, or collecting drums. Also offered is Tasc Sizer Control Sytem, Cold Dip Tank, Hot Dip Unit, Hot Spray Treatment, Drying Tunnel, Wash & Wax Unit, Roller Spray Unit, Wash Spray Unit, Brush Polishers, Inspection Conveyors, Roller Creepfeeder, Belt Elevator Feeder, Bulk Bin Tipper, Spray Tanks, and etc. Nicholson Machinery have developed a successful range of onion handling equipment which effectively minimizes crop damage and reduces labor cost. Nicholson Machinery manufacture onion harvesting equiment that includes, onion field topper, onion windrower, onion harvester and onion finish topper. They also offer complete handling and grading equiment for onion, potato, carrot, other root crop and vegetables. SGE providing a world class service to the onion, potato and vegetable industry meeting the exact demands with machinery that handles crops gently and efficiently. SGE has aligned with Tong-Peal who manufacturers a large range of machinery from Barrel Washer, Big Bag Filler, Bulker, Dryer, Polisher, Weigher, Big Bag Box Tipper, Box Filler, Caretaker, Destoner, Economy Wash Line, Hopper, Clod Seperator, Skips & Bins, U Polisher, Grading and Handling Equipment from single machines to full line systems. Weighing and Packaging machines which are suitable for packaging onion, potato, carrot, radish, garlic, lemon, orange, apple, and most any free flowing product, food or non-food. SGE supplies machinery specialized in packaging the various products into poly, paper, net and foil bags, as well as into trays, boxes, cartons, and crates. The equipment line ranges from Automatic Filling and Closing Machine, Fully Automatic Box Dispenser, Fully Autaomtic Filling and Sealing Machine, Weighing Machine, Fully Automatic Filling and Closing Machine, Fully Automatic Double Tube Net Clipper, Fully Automatic Packing Machine, and etc.